(From L to R) College students Ashish Gauli, Nathan Wikle and Ryan Yan have developed a website tool to help in the fight against invasive species. KNOXVILLE — Every day, invasive species threaten the health of vital agricultural and natural lands, from plants like the fast-growing kudzu vine to animals like the pernicious red scale insect that chomps through citrus crops. The US Department of Agriculture estimates invasives to be a $120 billion problem annually. Now there is a new tool to help in the fight against these non-native pests, developed by three college students during their summer research program at the National Institute for Mathematical and Biological Synthesis (NIMBioS). The tool is ComFlo, an interactive website that can be used to visualize the domestic transport of most common commodities in the United States. The website is critical in examining domestic transport as invasive species often land unintentionally in new areas via cargo ships, boats, airplanes, automobiles and other modes of transportation. Visit the site at http://www.nimbios.org/sre/comflo. Users can specify which commodity or mode of transport they are interested in as well as origin and destination states and then create a map or table to view the flow of that commodity between selected states. Users click on the lines on the map to view the actual tonnage of goods shipped between the two states. Results can also be downloaded. "We originally wanted a quick way to visualize domestic shipping flows in the U.S., as we had concerns that certain commodities might be vectors for the spread of particular invasive species," explained co-developer Nathan Wikle, a math major at Truman State University. "As we started analyzing and visualizing the data ourselves, we realized that we might be able to save other people a lot of time and effort if we made our work public." The red scale insect, a native of Southeast Asia, is an example of an invasive species that has hitched rides on the global transportation network. The bug has been transported on citrus seedlings to all arid and semiarid regions around the world where citrus is grown. In the US, it is currently localized to the state of California where it costs an enormous amount to control. Agricultural managers are watchful that it doesn't move to other states. As the students began working on their summer project to investigate the role of US shipping networks in the spread of invasives, they discovered there wasn't a good tool to help visualize the network. So they set out to create it themselves, using data from the Federal Highway Administration (FHA). "We were really motivated by the fact that we hadn't found a tool that visualized the data," said co-developer Ashish Gauli, a computer science major at Fisk University. "We really wanted something that was a web-based interactive system where users can change what they want to visualize and drill down big data to the individual level shipping information." ComFlo contains around 10 million data records. The FHA commodity shipping database that they drew from collects survey data every five years on all modes of freight transportation between the years 1997 to 2012 and includes forecast data up to 2025. The students expect the tool to not only benefit the scientific community but also transportation authorities, metropolitan planning organizations, local, state and regional planners and anyone else concerned with transportation, logistics and distribution of goods. As for invasive species, ComFlo might just help stop them in their tracks. "Prevention is the most cost-effective method for controlling the spread of invasives, but it can be difficult without the proper knowledge. With ComFlo, we aim to provide the information to identify significant pathways of invasion so that managers know which sites to focus their resources on," said co-developer Ryan Yan, a student majoring in mathematical biology at the College of William and Mary. "This tool almost cries out for invasion biologists and policymakers to use it, both to understand the relationship between commodity flows and the movement of introduced species across the landscape and to forecast what predicted changes in commodity flows portend for the future of biological invasions," said Dan Simberloff, the Gore Hunger Professor of Environmental Science at UT and the students' co-advisor on the project. The three students on the shipping project joined a highly select group of 15 undergraduates and two high school teachers conducting research as a part of the NIMBioS Summer Research Experience (SRE) for Undergraduates and Teachers program on the University of Tennessee, Knoxville, campus. From June 8 to July 31, the participants lived on campus and worked in teams with NIMBioS postdoctoral researchers and UT professors on various mathematical biology research projects. 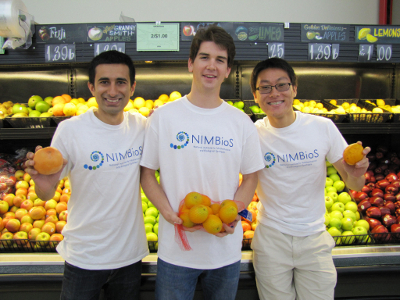 Located on the UT campus, NIMBioS fosters new collaborative efforts to investigate biological questions using mathematical and computational methods. More information on SRE is available at http://www.nimbios.org/sre.